A Life of Sugar and Spice: You have to fail to succeed? I'm still on the fence about the truth behind "healthier" baked goods. But at the same time, I'm giving these alternative recipes a shot, just to see. This past weekend I tried this recipe for almond meal pancakes that I've heard such great things about. I had purchased a bag of almond meal based on Tina's experiments that she deemed great successes. I don't know what I was thinking, but for some reason I had it in my head that almond meal was going to taste like flour. 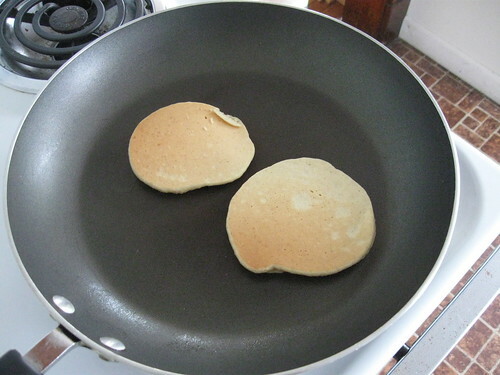 I whipped up the recipe and set to work on my first two pancakes, and when they were done, I dove in. Surprise! These taste like ALMONDS! How strange... The thing is, I the only way I like almonds is if they are coated in dark chocolate or ground into almond butter. These pancakes were dry and crumbly and nutty. NOT what I was looking for. At least I gave them a shot. Now what am I going to do with the rest of my almond meal?? Can you combine it with another flour to use for baking so you don't have the strong almond flavor? cookies!!! the flavor works really well for cookies, especially if you mix in some chocolate chips...or apples, or bananas, or raisins....it's still not going to taste like a "regular" cookie, but I still think it's pretty awesome. I agree with cutting the almond meal with another flour if you want to experiment with the texture. i have a bag of almond meal that has been gathering dust for quite some time. I keep meaning to use it - I really like almonds to snack on, so I feel like I'd probably like this.